You know, that’s kind of how I feel today. Something always comes up. Either it’s too cold, you’re too busy, you didn’t eat a good dinner last night, you didn’t sleep well, whatever. Something comes up as an excuse for you not to run, so you don’t. Not that you can’t. You don’t. Let me tell you where don’t gets you: two years ago, I couldn’t run. I physically could not do it. I couldn’t go 15 seconds without thinking my heart was going to pop out of my chest, that my legs were going to fail, and that I was going to have an asthma attack. I couldn’t even jog for half of what C25K‘s first interval of the first day of the first week. Well, today…I can. And I will. If everything goes according to plan, my new treadmill will be delivered this afternoon. I’ll spend a couple hours after work putting it together, and then I’ll throw on some music or something off Netflix, and I’ll run. But because I want to. Because I can. Because there is going to be some point in the future where I want to run, but I can’t. Because I’m sick or injured or just too old to keep it up. I will want to. 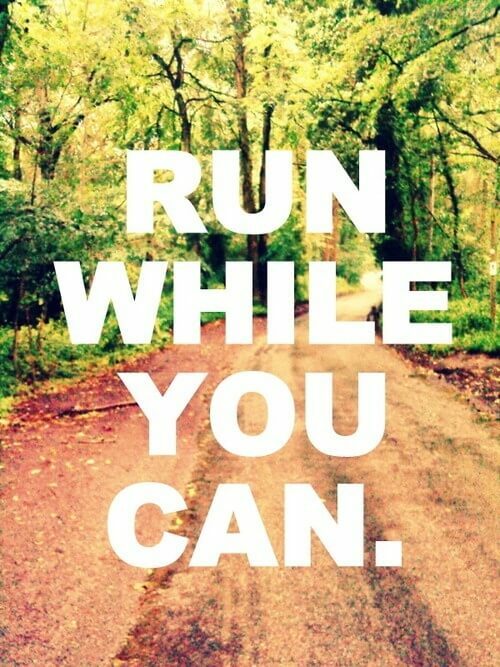 But I will not physically be able to run. But that’s not today. Today, I’m going to run while I can. That is why I dragged my only got 4 hours of sleep exhausted self out in the 31 degree cold yesterday because there are chances of rain/snow/crap the rest of the week and I wanted to get at least one run in. It feels good to be active huh! I have never been a runner, mainly because I am no good at it. But, I have never really tried. The last time I ran was about 8 months ago and I made it a mile. I haven’t tried since then and hopefully I will soon! I’m probably not any good at it, either. I never could run, so one day, I just decided that I should. I had to stop being lazy and trying to find excuses to prevent exercise. Like I said in an earlier post, I still hate running. The first couple miles are miserable while my body adapts, but after that, the runner’s high kicks in, and it makes every bit of it worth it. For people like you–and me, honestly–who don’t particularly like short distance running, you might try interval training that leads up to something longer where you can see if you like endurance. Then again, running may not be your thing at all. Agreed! But just like with food and treats, don’t beat yourself up if you need a rest day either. Rest and recovery is just as important for staying healthy and preventing injuries to keep you running longer!